"They needed a second chance to finish first." Indiana is a basketball-crazy state. That’s important to know before sitting down to enjoy Hoosiers, the 1986 feel-good film about a 1950s Indiana high-school basketball team. 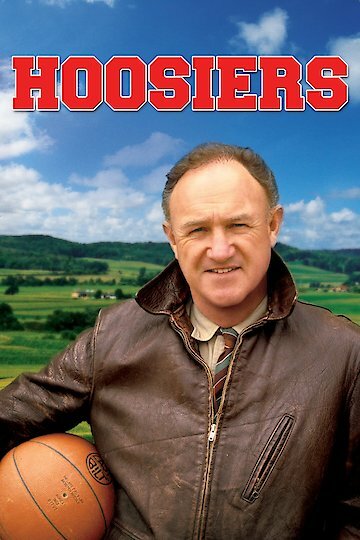 Gene Hackman plays Norman Dale, a washed-up former college coach who lands in the little town of Hickory, Indiana. Dale used to be great, but his legendary temper got him into trouble with college authorities. He finds himself adrift at mid-life, not sure what to do until an old friend, now a high-school principal, decides to give him a second chance at doing what he loves best. No one else in town knows his past, so it’s a chance to start over. Like many small towns, Hickory isn’t accepting of strangers, especially strangers with odd ideas about how to train their beloved boys’ basketball team. It takes a long time for Dale to win over the townspeople, even after his methods begin to take effect and the kids start winning. Barbara Hershey stars as Myra Fleener, a lonely teacher with a chip on her shoulder. She doesn’t like Dale messing with her kids, especially Jimmy Chitwood (Maris Valainis), the shy star of the basketball team. Dennis Hopper provides a memorable performance as Shooter, the basketball-smart but deeply alcoholic dad of one of the players. He initially embarrasses his son and the rest of the town, but Coach, who understands the need for second chances, tries to give Shooter another chance too. With Shooter’s help, the tiny team skyrockets to unlikely prominence in the state basketball tournament. David Anspaugh directed the film, which was inspired by the real-life state championship of a tiny high school team in Indiana. The Oscar-nominated score by Jerry Goldsmith has moments of lovely poignancy but also plenty of syncopated bounce and energy, particularly when it accompanies the many scenes of basketball games. Hoosiers is currently available to watch and stream, buy on demand at Amazon, Vudu, Google Play, iTunes, YouTube VOD online.